This page is the complete description and details for the summer camp Year Round Coordinator position including job responsibilities, dates, wage, etc. At the bottom of the page you can apply online and download the complete pdf job profile. Reports to: Assistant Director of Language Camps. Camps: Camps both throughout the year (a.k.a. “Full Immersion Programmes”) and summer camps. Language Centre: 3 English academies teaching both children from the age of 4 to adults. Language Travel: Trips abroad to countries such as USA, UK and Ireland during the summer. A typical day for this position would be divided between administration, recruitment and summer camp development tasks in the morning, and teaching English classes to kids, teenagers and adults in the evenings. Approximately 4-8 times a year we will have a “Full Immersion Programmes” which are essentially a mini-residential camp whereby a small group of around 40 students will come to a nearby site and where we will organize a camp filled with English classes, activities, competitions and fun! The Summer Camp Year Round Coordinator will be required to work on any of these camps that we have during the year to live onsite for the 3-5 days, and be a leader on this camp running the different aspects of the “Full Immersion Programme”. Whenever we had a “Full Immersion Programme” the person would be expected to devote themselves solely to these and so we would ensure to cover their other responsibilities for those days. During July and possibly August, this position would be work on one of our summer camps as a teacher, although might be considered for a mid-management or director position also depending on their ability and experience. This position would always minimally work one full month residential. Work closely with the Ast. Director of Language Camps assisting them with any development projects or administrative tasks as assigned. Responsible for organising and doing interviews in order to fill our needs for the following summer. Helping organise and attending certain summer camp specific weekend events such as Review Weekend in November, Training Planning Weekend and Spainwise recruitment conference in May, and Head Office training day in June. Attending monthly summer camp management meetings where they will participate in all major decisions for following summers. During summer months work as a summer camp staff member or manager depending on the person. Teach classes to young learners (4-18) with a maximum of 12 students per group and adults with a maximum of 8 students per group. Teaching classes typically from 17:35-20:15.21.00 or 21:50. Children have class for 1 hours, and teenagers and adults for 1,5 hours. On Fridays students can attend optional classes of 1,5 hour (except the 4 and 5 year olds who have 1 hour on Friday) to attend conversational classes and exam preparation classes. Since these classes are optional and attendance is slightly lower, classes are usually combined on these days, meaning total student numbers might be slightly higher per class on these days. Make sure that students in class never revert to Spanish and look after students’ welfare. At TECS we believe in a 100% English environment in our English academy. Any student–teacher and student–student interaction should always be in English at all times. Liaise with the Centre Manager on matters connected with student progress, absences, welfare and behaviour and record incidents through our online observation registration system. Prepare professional and effective lesson plans based on the year’s syllabus and the students’ needs. Prepare the students for their external exams depending on their age and level, most notable Cambridge and Trinity exams. Monitor the progress of the students, giving periodic progress checks, keeping a record of progress made and correcting students work in both activity books and notebooks. Creation of activities on TECS online platform. Attend all staff development meetings held at TECS. Commit to professional development through continued learning and mutual support, classroom observations and feedback. Special events, such as Halloween party, Christmas event, Easter egg hunt and the end of year party. Supervision of external exams held in our centres. Please note that the events mentioned above, might sometimes be instead of class hours, but other times in addition to teaching hours. Attend any teacher meetings or teacher development sessions as scheduled. Be responsible for teacher room tidiness and book inventories. Assist with the planning and development of the programme for each FIP. Live on-site during the Full Immersion programmes. Act as a leader and English teacher during the programmes. These programmes are a similar type timetable to summer camp and will not come with a lot of time off (generally between 2-4 hours a day when possible) as they are 24/7 style programmes so candidates must be aware and ready for the challenge. We will of course try and make this up to people when possible by giving them a day off after the programme is finished to recharge. If a FIP or Camp took place in Easter week, this position would be required to work it. Work on summer camp in assigned position for min one month residential. If later on a year round contract work either 1 more additional month in assigned residential position or in teaching role. For full summer camp responsibilities rather to relevant summer camp profile. The candidate would be required to attend any meetings as set, which are generally during normal office hours, such as the weekly meetings with the assistant director of language camps, the weekly teachers meetings, and the monthly summer camp meeting. Twice a year we also organise summer camp weekends which the person will be required to attend including the Development Weekend in November and Training Planning Weekend in April/May. In addition to this the candidate is required to attend any development days such as the ACEIA teaching conference that TECS will sponsor teachers to attend, and all staff development meetings held at TECS. At TECS we furthermore believe in continuous professional skills development and we require any new candidates to actively participate in our internal development training programme. Regular (usually monthly) feedback will be provided from the Assistant Director of Language Camps about job performance and objectives. The candidate will be actively involved in the setting of targets and the continuous monitoring and assessing of these targets. Also the Ast. Director will be will be available at all times to discuss concerns or problems that may occur. We welcome your frequent feedback on how your job is going for you. The candidate would usually be expected to complete a typical full-time Spanish work week, meaning that they would be expected to work 8 effective hours each day Monday-Friday (the candidate would have an hour for lunch on top of that). As the candidates classes will typically finish at either 20:15, 21:00 or 21:50 a typical day would be something like 12:00-21:00 or 12:50-21:50. Candidates are permitted to use an up to an hour of their morning work period time for planning per day but are expected to adapt this to the time and responsibilities pressure they have in different moments of the year. Should there be a Full Immersion Programme then the candidate should recognise that very long hours will be expected of them as the programme could run from 08:30-23:00. We will always do our best to try and organise for the candidate to have some time off each day (2-4 hours) when possible, and make up for it by giving the candidate a day off after the programme is finished. At certain points of the year the person will be required to attend certain events on the weekend including the Development Weekend in November, Training Planning Weekend in April/May, and the Spainwise recruitment conference in May. Except for things like classes and Full Immersion Programmes we are very willing to be flexible with the hours of work as we would like to develop and understanding with the candidate that they we are willing to be flexible with their work hours as we also acknowledge that we will expect that understanding in certain moments back. Candidates should note that May/June prior to camp kick tend to be long and hectic days for all year round staff. What type of company is TECS? TECS is a company that has been running both summer camps, English academies and programmes abroad for many years. We consider ourselves to be both very experienced and very passionate about education, be it English or otherwise. We are a medium sized company with many different staff, both Spanish and native English speaking, in different departments. In the summer camp department the year round team is a small one; all of us started off as monitors or teachers and moved up through the summer camp structure as mid-managers and directors so we all are full of energy and passion for what we do, and are extremely hard work. This position is most suitable for a person who has either recently graduated as a teacher, has worked on one of our summer camps, and is looking to move into the world of TEFL Teaching or education and looking to gain experience and responsibility quickly. We are looking for a candidate with a genuine passion to succeed and develop professionally who would like to stay in touch with teaching English but would even more importantly like to take on a new challenge of recruiting staff and assisting with the running and planning of summer and year round camps to the best possible standards. They must be someone who takes pride in their work and have a real ambition to be good at what they do. Also to fit into our ethics, they should be someone who can be passionate about their work and get a genuine buzz from triumphing in their tasks. We are looking for people to take the company forward rather than maintain where it is so, definitely the person must be someone who isn’t afraid of hard work and someone who can recognize that a job can be fun and rewarding. In short, the ideal candidate for us is someone full of energy, with untapped potential (we’re good at spotting itJ) and is looking for a job that tests them but also one they can be passionate about. But what makes the job interesting for me? This position is a multi-faceted one that allows the candidate to gain a lot of experience in many areas, and allows them to experience the benefits (and challenges) of each area. 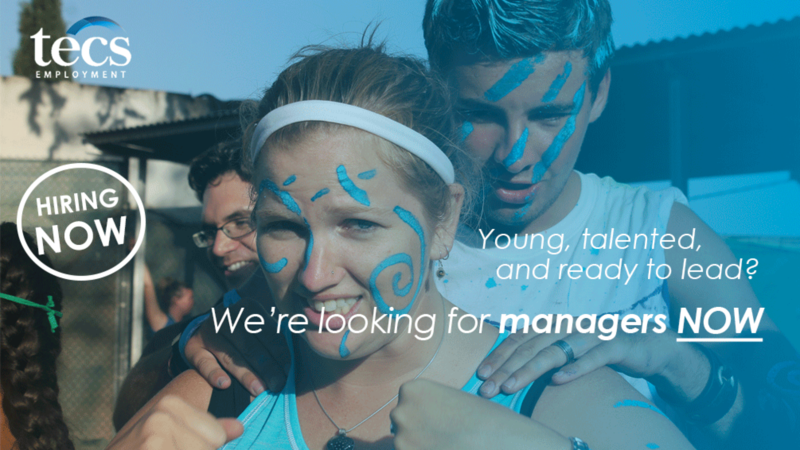 Not only will the candidate be able to develop and hone their skills as a teacher while continuously have contact with a range of students in the classroom, the Full Immersion Programmes, or summer camps they will also learn and develop some management skills such as the planning, organisation and recruitment involved in running camps. Anybody in language education interested in becoming more involved on a different level will find this a rewarding position as it allows them to learn more about the running of summer camps. TECS is run by dynamic young people, and our enthusiasm and dedication to what we do makes that we have a lot of eye for detail when dealing with our students, clients, suppliers and staff. The successful candidate will find this a job they can enjoy and care about and will find TECS a supportive and caring company (group of people) in which to develop professionally. But surely there must be some downsides, nothing is perfect? Of course, like any job, this position and working at TECS definitely has some downsides. One reality is that whilst we are an extremely supportive team, we are also a very hard working one, hence TECS is definitely not for people who have a 9:00-17:00 work mentality. It is a passionate environment where you have the chance to genuinely believe in what you do but this comes at the price that we expect all our team to give what it needs to complete a goal. In addition to this that with Full Immersion Programmes and summer camps the candidate often ends up working extremely long hours due to the intensive, residential nature of the programmes. In short, if you are looking for an easy position that allows you to have an easy life, this job is not for you. Please also note that it can be overwhelming to coordinate the various tasks that the person would be responsible for in a timely and organized fashion: teaching English, interviewing and recruiting the 150+ staff needed for summer camp, updating our information for the next recruitment year, developing new resources, and acting as a leader during a Full Immersion Programme are just a few examples of the person’s responsibilities, so the position is more suitable for teachers who would like to get involved in tasks that go beyond teaching. This means that during busier times such as closer to the summer recruitment and interviews have a higher priority and the candidate has to manage their English classes and teaching quality in a way that allows them to put less preparation time into this. Another thing for candidates to bear in mind is that whilst our managers are great people developers and educators who are happy to support anybody on their team when needed, we also value people taking initiative when it comes to working around hurdles that come up and suggesting and trying out possible solutions, as well as feeling responsible and accountable for their areas of responsibility. The candidate should not be afraid of dealing with stressful situations when they arise, keeping their heads cool and suggesting solutions to resolve an issue in the best way possible. An international, passionate and dedicated work environment where people from different countries and backgrounds work together to provide the best English language programmes possible. You will find that we are a hard-working team of young people, wishing to make every single student’s and staff member’s experience a rewarding one. A supportive work environment and structure where we encourage people to develop professionally and personally during their time with us and become independent and proactive members of staff. Training induction and continuous professional development (both in-house and external) throughout the year. TECS covers transportation and entrance fees for the annual ACEIA conference in Seville in November. We encourage teachers who are interested to prepare in-house development sessions for their peers and work towards giving a talk at the ACEIA conference at a later stage. Social staff events during the year, such as at Christmas and at the end of the academic year, amongst others. The option of attending Spanish classes once a week. Catered lunch supplied on-site in our El Puerto Central centre for teachers teaching over the lunch-hour. Official Spanish contract from 1st October – end of summer camp contract with full Social Security coverage and full unemployment, hospitalization and pension contributions paid in by TECS. The option of staying in the TECS apartment residence where some of our staff members stay for a nominal fee. Long term prospect after 1 or 2 full year cycle of being offered a full year round position which would include 3 additional weeks of paid holiday in September with 2 month’s being work in camp (min one residential). If the person performs to the level required and it is in the interest of the company to do so, there is the possibility of the person having a 12 month contract the year after with paid holidays in September. Working alone and being responsible for completing important tasks with limited support or supervision. Working in a fast moving environment where stress levels and responsibilities can at times be very high. Summer camp experience, but not essential. Experience of learning a foreign language and living abroad preferred. A College / University Bachelor’s in English or Spanish language or in Education. A valid in date European Driving Licence. Good interpersonal skills, with ability to communicate effectively and professionally with others and especially with customers. A positive attitude towards the job and the ability to respond positively to challenges and workload. A professional and above all flexible attitude towards all responsibilities. Knowledge of computer programmes such as Microsoft Office, using databases and internet and emailing programmes. Basic knowledge of payments (dealing with invoices, basic accounting and handling money). A good level of Spanish and experience in Spanish culture. Skilled at being able to prioritize. Focussed on targets and achievements. A high sense of accountability for targets and areas of responsibility. Stress resilient and able to deal with stress in a professional way. A friendly and open attitude with good customer service and communication skills. A passion and interest in the job. Critical assessment of own performance aimed to always learn and improve. PAY: Monthly wage of €1090* gross. Trimester 1: €100 Exceptional, €100 Very Good and €40 Good. Trimesters 2+3: €300 Exceptional, €200 Very Good and €100 Good. This bonus would be assigned on job performance and quality of programmes run. It is also possible the candidate would receive no bonus. SUMMER PAY: The candidate would receive the pay for whatever position they ended up working as during the summer (TEFL teacher, Coordinator, Director, etc.). They would get the difference paid on top of their normal monthly wage as a supplement. They would also be entitled to any summer bonus that were available for the particular position they did. ACCOMODATION: We have a company apartment, affectionally called the TECS Flat, which we would offer to the candidate to stay in. The flat is a shared apartment where usually anywhere between 2-5 people will live in during the year. At certain points TECS may need to house a lot more people such as during training weeks or two or three weekends during the year. As a result the person would need to understand that they would be required to share a room whenever needed. For this reason the candidate would receive this accommodation should they want it at the very economical price of €150 per month. If the candidate ended up being chosen to be the “flat responsible” (looking after the house, communicating issues, getting rooms and things ready when people were arriving) then they would get receive the master bedroom and would only be charged €50 per month. MEALS: As our offices are based in a school, TECS offers its staff the option of having lunch onsite in our school canteen Monday-Friday. During the summer camps or during any Full Immersion Programmes the candidate would have all meals provided for while the kids were there. *Gross pay could be a little bit more or less than this. Full confirmation would be provided in the event of a contract offer.